Benary's Giant Mix - Zinnia elegans - Annual; This variety was developed for the cut-flower industry and provides huge fully double dahlia - like 5 inch flowers on strong stems. Colors are red, pink, yellow, white, purple and orange. Full sun; plant height: 40-50in. California Giants, Mixed - Zinnia elegans - Annual; Big 4-7in. blooms on sturdy stems. Colors includes shades of red, yellow and purple. Drought resistant; Full sun; plant height: 2-1/2to 3ft. #B1-144 bulk seed, $36.99 1 lb. Envy - Zinnia elegans - Annual; A profusion of 2 inch chartreuse dahlia-type flowers will catch your eye. Semi-double blooms on upright plants bloom through the summer. Full sun; plant height: 36in. Giant Cactus Flowered, Mixed - Zinnia elegans - Annual; Big 3-5in. tetraploid blooms on sturdy stems. Colors includes shades of red, yellow and purple. Drought resistant; Full sun; plant height: 2-1/2to 3ft. #B1-145 bulk seeds $19.50 1 lb. Macarenia - Zinnia elegans - Annual; Scarlet petals with contrasting golden tips. Very showy. Large 3 inch mostly double blooms. Strong stems make excellent cut flowers. Drought resistant; Full sun; plant height: 2-1/2to 3ft. Mazurkia- Zinnia elegans - Annual; Ruby red petals with white tips. Makes an amazing show alone or mixed with Macarenia (above). Strong stems help make it a great cut flower. Drought resistant; Full sun; plant height: 2-1/2to 3ft. 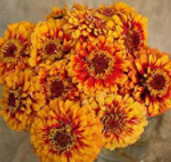 Old Mexico -- Zinnia haageana - Annual; Very uniform 26 inch plants bear dozens of bright multicolored blooms. Variations of browns, reds, and yellows, some solid, many more bicolors in a variety of patterns make this a good companion to sunflowers. All American Selections winner in 1962. Full sun; plant height: 26in. Persian Carpet - Zinnia haageana - Annual; Well-branched spreading plants bear semi-double and fully double 2 inch bicolor blooms of red, gold, mahogany and cream. Continues blooming well even in the heat of summer. Full sun; plant height: 28in. Queen Lime Orange- Zinnia elegans - Annual; 2017 AAs Winner - Real showstopper! Coral oange petals have inner lime green ring and red-rose centers. Colors mature to peach-orange with yellow-lime and scarlet centers. Large 3-4 inch double dahlia blooms on strong stems. Height can reaach 4ft when crowded. Long lasting cut flower. Drought resistant; Full sun; plant height: 28-48 inches. State Fair Mix - Zinnia elegans - Annual; 4 inch single, semi-double and double blooms in scarlet, orange, white rose, salmon, yellow & white. Full sun; plant height: 36in. #B1-465 Bulk seeds $48.50 1 lb. Whirlygig - Zinnia elegans - Huge semi-cactus flowered blooms are tinged with contrasting colors at the edges. Good cut flower variety. Full sun or partial shade; height: 27in. 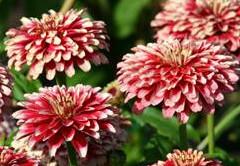 Dreamland - Zinnia elegans - Annual; Hybrid that combines the elegance of dahlia flowered blooms and a compact growth habit. 4in. fully double blooms on high performance plants. Mix contains blooms in all of the colors listed below. Full Sun; height: 12in. 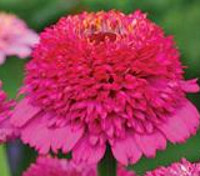 Lilliput Mixed - Zinnia elegans - Annual; Small pompom blooms on 18in. stems. Great summer color. Shades of white to red. Drought resistant; full sun; plant height: 12-18in. #B1-146 Bulk seeds $41.50 1 lb. 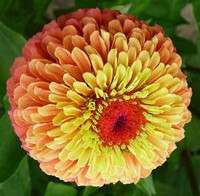 Magellan Series - Zinnia elegans - 5-1/2 inch dahlia blooms on dwarf plants. Profusely flowering throughout the season. Full sun or partial shade; height: 15in. Profusion Series - Zinnia elegans - Annual; Compact plants earn their name by bearing dozens of single 2 inch blooms, so densely packed as to form a carpet of color. Shades of red, orange and white are included in this mix. Full sun; plant height: 12in. Red Spider - Zinnia tenuiflora - Annual; Heirloom variety documented as early as 1801. Sinlgle red spidery blooms on upright stems bloom all summer into frost. Full sun; plant height:24in. Sombrero - Zinnia haageana - Annual; 2-3in. red and yellow blooms. Eye-catching & a great companion to sunflowers. Drought resistant; Full sun; plant height: 1-2ft. 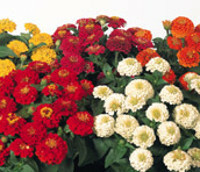 Swizzle - Zinnia elegans - Eyecatching bicolor 4in. blooms with darker color in the center, edged in white. Compact bushy habit makes a perfect bedding or container plant. Full sun; height: 12in. 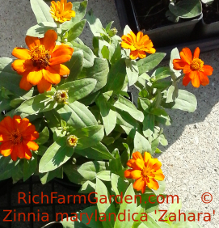 Zahara - Zinnia marylandica - High disease and drought tolerant. Last all season. Spreads to 18 inch. Good container variety. Full sun or partial shade; height: 27in. Belonging to the Daisy family, Compositae, Zinnias originated in Mexico and have become one of the most popular bedding plants world-wide. Easy and quick to flower, these cheerful annuals provide bright long-lasting color during the heat of summer. They resist disease and drought, come in almost every imaginable color and several different forms - dahlia blooms,cactus blooms, scabious bloom, double, single, tall and dwarf. Most bloom from seed in 60-80 days. They prefer a well-drained soil (but are very adaptable as to soil type) and plenty of sun, they are one of the very best summer plants available. 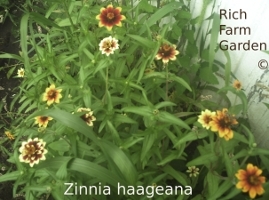 Zinnias can be grown directly in the garden from seed or as transplants. FOR TRANSPLANTS: Sow seed in pots or trays at a depth of 1/4 inch. Keep moist at 65F. Transplant seedlings to larger containers when they reach about 2 inches tall. Transplant outdoors when all danger of frost has past. Spacing varies according to variety (dwarf varieties from 6-12 inches apart in rows 12 -18 inches apart). DIRECT SOW: Sow seed in prepared garden space, 1 seed every 3 inches in rows 12 - 18 inches apart. Thin seedlings to 1 every 6-12 inches, depending on variety. Cultivate to keep down weeds. Zinnias make excellent bedding, border or cut flowers.